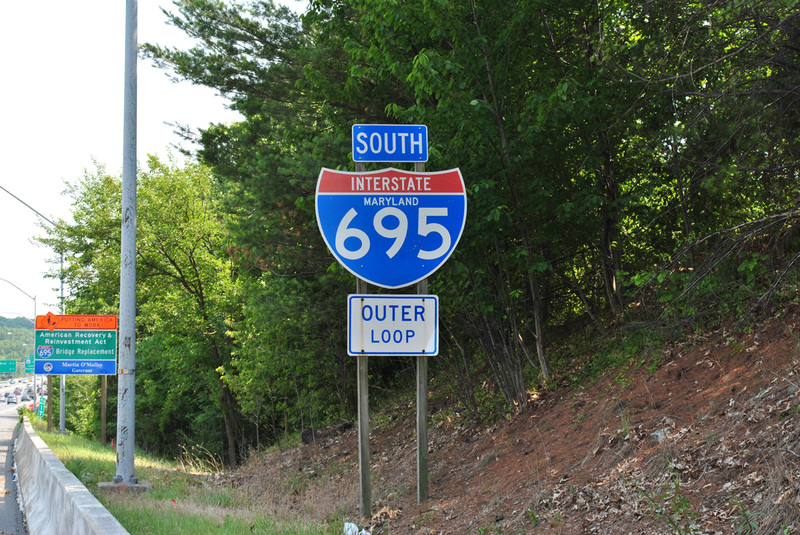 A heavily traveled freeway, Interstate 695 encircles Baltimore as both a busy commuter route and a truck bypass. Milepost 0 is located at the double leaf bascule on the Curtis Creek Bridges at Hawkins Point in Baltimore city. The Baltimore Beltway uses a sequential exit numbering system due to the close proximity of interchanges. The entire 51.57 mile1 long Baltimore Beltway is signed as Interstate 695. The Maryland Department of Transportation (MDT) 2016 Highway Location Reference (HLR) logs attribute 29.17 miles to IS 695 in Baltimore County, including the 1.52 mile overlap with IS 83, and 2.92 miles in Anne Arundel County. This figure represents the beltway from Interstate 97 near mile marker 3 clockwise to I-95 at Rossville (Exit 33). 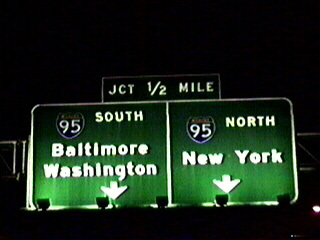 MD 695 extends the beltway 11.366 miles south from I-95 to the Baltimore city line past mile marker 48. MD 695 resumes along the Beltway another 2.48 miles west from the city line, from a point 0.16 miles ahead of MD 710, to Exit 4 with I-97 south. 3.34 miles of I-695 fall within the city of Baltimore, including the 1.6 mile long Francis Scott Key Bridge. The toll bridge across the Patapsco River is maintained by the Maryland Transportation Authority (MDTA). 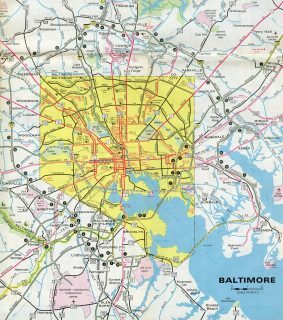 The Baltimore Beltway was completed north from Maryland 2 in Anne Arundel County to U.S. 40 (Pulaski Highway) east of Baltimore in 1962. 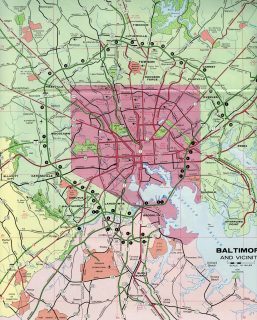 The next portion to open was the Southeast Freeway between Pulaski Highway and Maryland 150 (Eastern Boulevard) in 1972.2 This section was later dropped as part of the Beltway mainline, with I-695 shifting westward along portions of the Winlass and Patapsco Freeways. The Baltimore Beltway was vastly complete in 1976 with the exception of the Francis Scott Key Bridge and its approaches, which opened a year later. 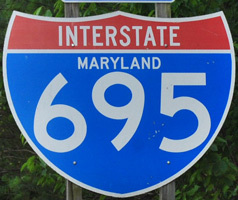 Signs for the beltway displaying Maryland 695 were later replaced with tri-color Interstate markers for continuity purposes. Button copy overhead for I-95 on Interstate 695 northbound at the parclo interchange with Maryland 7 (Exit 34). Vidcap taken 09/93. 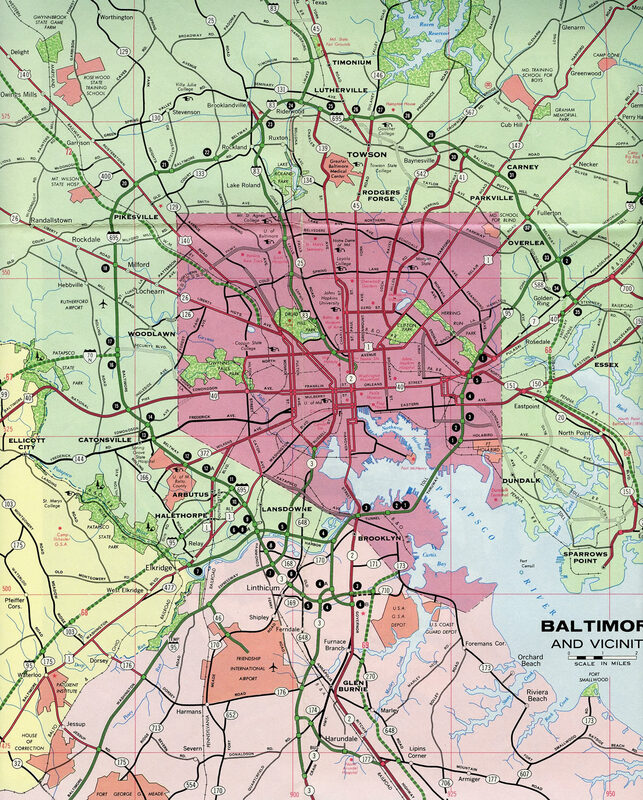 Expansion plans underway in the early 2000s estimated $800 million in funds needed for widening two sections of the Baltimore Beltway. Options considered including adding Express Toll or High Occupancy Toll (HO/T) lanes with variable rates based upon traffic congestion and time of day. Sections outlined for widening from six to eight lanes included the Beltway north from I-95 at Halethorpe to MD 122 (Security Boulevard) at Woodlawn and I-695 east from I-83 near Towson to I-95 near Overlea.4 HO/T lanes were not implemented along the Beltway at that time. Interstate 695 advances a half mile north from MD 7 (Philadelphia Road) to the systems interchange (Exit 43) with I-95 by Rossville. Photo taken 07/02/10. A cloverleaf interchange (Exit 32) joins Interstate 695 with U.S. 1 (Bel Air Road) at Overlea, 0.75 miles north of the exchange with I-95. Photo taken 06/30/10. Construction from 2008 to 2014 rebuilt the substandard junction at I-95/695 into a systems interchange. Work coincided with the addition of tolled Express Lanes along Interstate 95 between I-895 and MD 43 (White Marsh Boulevard). Photo taken 06/30/10. Interstate 95 and the I-95 Express Lanes extend north from the merge with I-895 (Harbor Tunnel Thruway) through the community of Rosedale to meet the Baltimore Beltway at Exit 64. Photo taken 01/04/19. Three lanes depart from the general travel lanes of Interstate 95 northbound for the Beltway inner loop to Essex and Dundalk and the outer loop to Overlea and Towson. Photo taken 01/04/19. Exit 64 leaves Interstate 95 southbound ahead of the Rossville Boulevard overpass for the Baltimore Beltway. Photo taken 01/04/19. High flyovers span both I-95 and the Baltimore Beltway at the multi level exchange between the two freeways. Photo taken 01/04/19. A four lane opens northbound along I-695 from the Washington Boulevard (U.S. 1 Alternate) entrance ramp to Exit 11A for Interstate 95 north. Exit 11B follows as a loop ramp for I-95 south. Photo taken 12/30/08. Interstate 695 southbound spans Southwestern Boulevard (U.S. 1), AMTRAK and Benson Avenue with six lanes. Three separate at Exit 11 for I-95 north into Baltmore and southwest to Laurel and Washington, DC. Photo taken 12/28/07. Interstate 95 enters the directional cloverleaf interchange (Exit 49) with the Baltimore Beltway beyond the Sulphur Springs Road underpass at Arbutus. A left side ramp links with the inner loop north to Pikesville and Towson. Photo taken 06/20/12. A left exit links Interstate 95 south with I-695 east to Halethorpe, Landsdowne and I-97 south for Glen Burnie and Annapolis in Anne Arundel County. Photo taken 06/27/10. Maryland Interstate and Beltway Mileage Report, Maryland Department of Transportation (MDOT), December 31, 2016. Francis Scott Key Bridge (I-695) mdta.maryland.gov. “Tolls may help fund Beltway expansion.” Baltimore Sun, November 14, 2003.